Oil with white Alba truffle aroma. Discover the light garlicky fragrance of the famous, highly-prized Italian truffle and savour the surprisingly fruity aroma! A drizzle of oil is enough to enhance all your dishes. 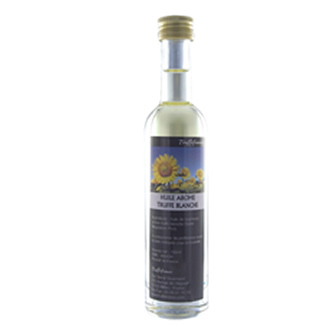 Use: lightly drizzle the truffle oil over your fresh pasta, potatoes, purees, carpaccio, salads, toasts, mayonnaise, fish or grilled meats, etc. Ingredients: sunflower oil, white truffle aroma.